Dhaka, Apr 26 (Just News): Leaders of quota reform movement today issued an ultimatum to the government for publishing within April the gazette on abolishing the quota system in government job as per the prime minister's decision. Otherwise, they will wage a tougher movement form the next month, they said at a press briefing on the Dhaka University campus. They also reiterated their demand for withdrawal of all the five cases filed during the quota reform movement within the next seven days and also urged the authorities concerned to find out the real culprits and bring them under justice. The cases against the unidentified persons are resulting in harassment of innocent students, they claimed. Demanding security of the students on the campus, the leaders also claimed that protesters in all the universities throughout the country are facing various kinds of harassment. Besides, the quota leaders also demanded apology from a Bangla daily Daily Janakantha for publishing "biased news" against the movement. 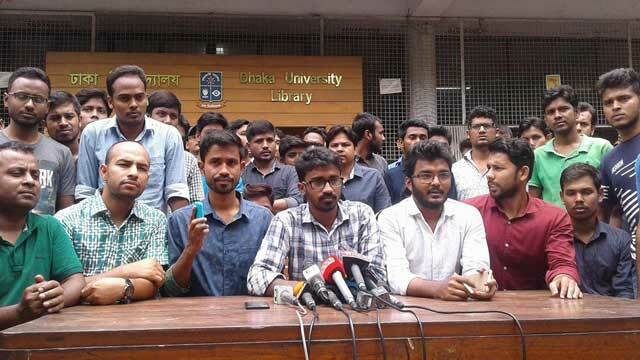 Student leaders of the quota reform movement Rashed Khan, Nurulhaq Nur, Hasan Al Mamun, and Faruk Hossain were present at a press briefing among others. Earlier, the students issued a seven-day ultimatum for withdrawal of the cases on April 18. The five cases were filed with Shahbagh Police Station on April 11 by Dhaka University authorities and police against a huge number of unidentified people on charge of vandalism, arson and obstructing lawmen to perform their duty during demonstrations in Dhaka over quota reform in public service recruitment and in connection with the attack on DU VC’s residence. Earlier this month, the country witnessed a widespread movement of students of public and private universities across the country, demanding reforms to the quota system. The protesters blocked key points in the capital and also roads and highways elsewhere over four days. Amid the protest, Prime Minister Sheikh Hasina on April 11 announced scrapping of the quota system in public service recruitments.